Depreciation is a business expense, it represents the reduction in value of a long term asset due to wear and tear. This calculator produces a declining balance depreciation schedule setting out how the cost of an asset is written down to its salvage value using the declining balance method. This declining balance depreciation schedule calculator can be used to calculate the depreciation expense for an asset for up to a maximum term of 3,650 periods. The calculator will produce a depreciation schedule setting out for each period, the beginning asset balance starting with the cost of the asset, the depreciation expense for the period, and the ending net book value of the asset. In addition, the calculator will also calculate the useful life of the asset representing the number of periods taken to reduce the asset from its original cost to its estimated salvage value. The Excel depreciation calculator, available for download below, is used to produce a declining balance depreciation schedule by entering details relating to the cost and salvage value of the asset and the declining balance depreciation rate. Enter the cost of the asset. The cost of the asset can be found in the long term asset account, asset register, or on the original source document (invoice) for the asset. Enter the salvage value. The salvage or residual value is the amount the asset is expected to be worth at the end of its useful life. If the salvage value is zero, the asset is depreciated down to a net book value of 1.00 in the depreciation schedule. Enter the declining balance depreciation rate to be used on the asset. The depreciation rate entered is for a period. For example, if the period is defined as a year, the depreciation rate entered must be for a year (e.g. 20% a year). If the period is defined as a month then enter the appropriate rate for a month (e.g. 2% a month). The calculator can deal with any length period (quarter, week, day etc.) provided the appropriate rate is entered. The declining balance depreciation schedule calculator works out the useful life of the asset based on the information entered. The asset life is the number of periods (years, months etc.) over which the asset is reduced from its original cost to its salvage value at the rate of depreciation entered. In addition, the calculator provides a declining balance depreciation schedule setting out for each period the beginning asset balance starting with the cost of the asset, the depreciation expense, and the ending net book value of the asset for each period of the assets useful life. The declining balance depreciation schedule spreadsheet is available for download in Excel format by following the link below. 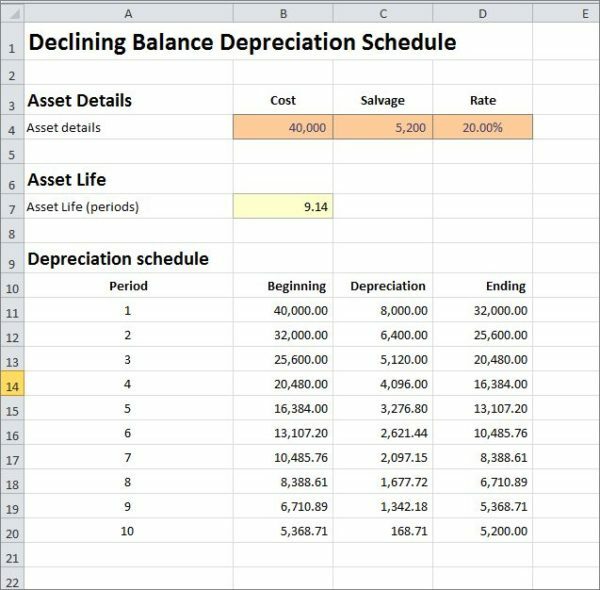 The declining balance depreciation schedule calculator is one of many financial calculators used in bookkeeping and accounting, discover another at the links below. Users use this declining balance depreciation schedule calculator template at their own risk. We make no warranty or representation as to its accuracy and we are covered by the terms of our legal disclaimer, which you are deemed to have read. This is an example of an asset depreciation schedule calculator that you might use. It is a purely illustrative fixed asset depreciation schedule. This is not intended to reflect general standards or targets for any particular company or sector. If you do spot a mistake in the declining balance asset depreciation schedule calculator, please let us know and we will try to fix it.